The 2017 Mother Culture Reading List! It’s that time again! For those of you who are new around here, let me briefly explain. Each summer, I compile two lists of recommended reading. 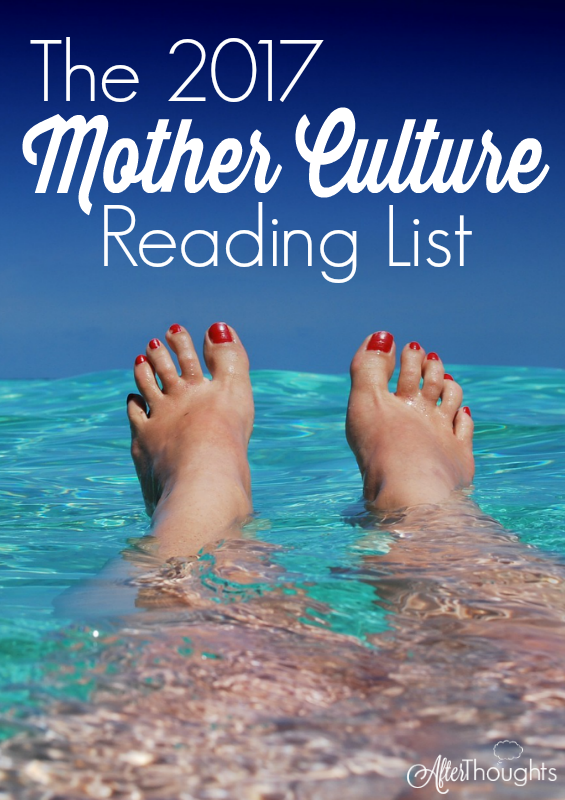 The first one this year is the Mother Culture Reading List. 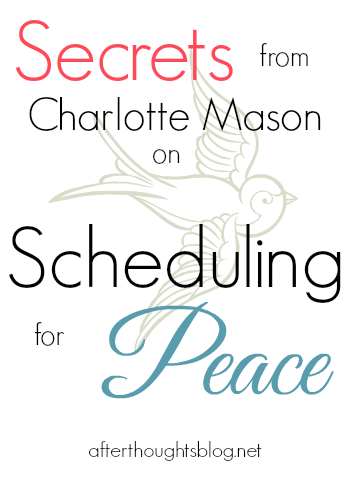 This is totally a Charlotte Mason thing, and if you want to know more about it, I wrote a post on Mother Culture that you should check out. 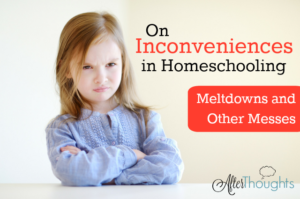 Here’s the deal: Homeschooling takes a lot out of us. No matter how hard you try, no matter what preventative measures you take, you’re running on empty at the end of the year. This isn’t necessarily a bad thing. You know that uncomfortable feeling you have the day after a good workout? Or how tired you are after you spend an afternoon working in your garden? And how rewarding the rest feels because of all the hard work you put in? You put in some good work this past school year, Mama. Good job! And now it’s the day after the workout. Time for some supplements, a little stretching, and other means of restoration. That’s one way of looking at Mother Culture. It’s restoration. Your muscles are weary because of the good work you’ve done — there’s no regrets. But we do need to put back what we take out, or we just might burnout. What is burnout but running the car with the gas tank on empty? Taxing resources you don’t have? This summer, make time for reading. Build up your soul. Re-find your thoughts. Mother Culture is the easier, less complicated of the two lists I put out. Please don’t think of this as the “slacker list.” This is simply the kind of reading for average, normal mothers. It’s especially good in the early years when you feel like you’re dying of baby-induced sleep deprivation (or the later years when you feel like you’re dying of teenager-induced sleep deprivation). It’s a casual affair, really. You keep three books going: a stiff book, a moderately easy book, and a novel. You pick up the one you feel fit for. You read for half an hour per day (minimum — but doesn’t have to all be at once). The purpose of my list is to help you get your list going. The books I share here are books I’ve read, books I’m reading, or books on my own summer list. I never recommend books I wouldn’t read myself, and I try to recommend the best of the books I’ve read over the years (because why make you suffer through the so-so books?). These are the challenge books. You might not get through very many pages your half an hour reading slot, but you’re really challenging your brain. The books are fantastic! But they are also akin to a thick protein shake — you won’t be able to read them every day. This sort of reading grows you as a person, though, and it also makes you fit for the coming school year, so don’t avoid it. These books aren’t as hard as the challenge books. There might be sections you can breeze through. At the same time, you’re still picking up new ideas, finding things to ponder, and (never forget it) growing your soul. These books books aren’t necessarily easy — they’re not twaddle, after all. If there’s one word we can use here, it’s probably delight. These are the hardest to put down when it’s time to move on to something else. There are a few steps to summer reading; gathering your books and scheduling your time tends to precede actually reading. You might also like to get a simple journal because a great companion to reading is writing — your thoughts, questions, and favorite quotes are all fair game. Do these have to be during summer? Because this summer we moved 4 states away, sold a house, and my husband started a new job that threw us all akilter and I’ve taken every spare minute to nap. Not kidding. So now that we are starting school would it be fine to work through some of these in the afternoons or evenings? Or do you think I would be further burdening myself with school pre readings? Awesome list and approach to reading. Brandy made some great 31 day posts that would nourish my mind during late night feedings! I’d usually read one and then go off on rabbit trails, linking to other posts. If you want basic, For The Children’s Sake or for a little more Karen Glass’s Mind to Mind. 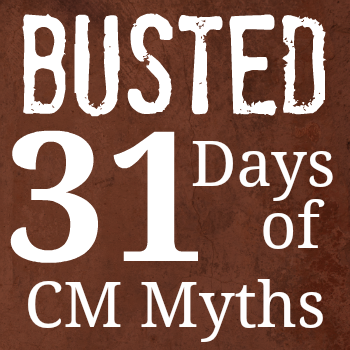 rereading CM is always a good idea. I read through it so quickly the first time it’s a wonder if I got anything but going back to it again brings out different aspects of it! God speed! Perfect timing! I am leaving on a glorious six day mommy vacation next week (visiting my single sister in her quiet, childless home, during which time she will be working, so I will have 2 days of complete and utter silence. Be still my heart. 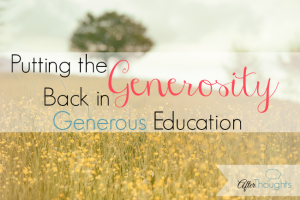 My husband and his parents are so generous to send me off to recover from the last 2 years of schooling). I have been mulling over my reading list for the last two weeks, wanting to take along an easy, medium, and difficult (soul-stirring) book (that were not education related). I read through your lists for all three years, filled up my Amazon cart, and then looked at it over and over for the last three days. I settled on “desiring the Kingdom” and “The Unsettling of America.” I am also taking along “The Japanese Lover,” by Isabel Allende, and “Brothers Karamozov” (although my copy seems a bit ridiculous for a carry-on). Thanks for the recommendations. Can’t wait to dig in! My new books arrive tonight! I have the same problem as Jen in not being able to limit the number of books. A few times I’ve suddenly remembered that I’d started a book & forgotten that I hadn’t read it in a while. At present I’m slowly going through Norms & Nobility, have nearly finished C.S. Lewis’ Weight of Glory (both stiff reading for me). On to the last chapter of Cancer Ward by Solzhenitsyn – I love Russian lit & I’ve been rocketing through this – much easier on the brain than Dostoevsky. The Disappearing Spoon – I’m not enjoying this one as much as I thought I would as the writer’s style annoys me…Looking forward to the next book in the Rowland Sinclair novels, an Australian historical crime series by Sulari Gentill when life settles down a bit more. Stiff: Re-reading (fairly quickly) CM Volume 3, intend to follow that with Pastor Agnorum (from the MEC list) and then get back to Norms and Nobility that I’m taking a break from. Also reading some theology – got a great couple of lists from both of my pastors to work through. Moderate: Currently reading Henry IV and Booked (a literary memoir) and a fair amount of Flannery O’Connor – stories, essays, and letters, mostly for a writing class I am taking. Novels: I am slowly reading Persuasion with my hubby and just started Brideshead Revisited so I can follow along with the Circe Close Reads podcasts. I also am hoping to get to the Father Brown mysteries this summer (hubby bought me a compilation for Christmas). Love these lists, Brandy! I’m really hoping to get more reading done this summer. My Mother Culture time has really been pretty non-existent as of late and I’m in desperate need of changing that! I did have a quick question…how does one go about compiling a list like this of their own? Does the books per category vary per the individual? For instance, what may be considered “stiff” for me might be in someone else’s “moderately easy” category, am I understanding that correctly? Thanks again for putting this out here for others, like myself, to learn from! Love your lists, Brandy! I have never read a book about Russia or by a Russian (ahem, bad English major that I am), but “Laurus” has me intrigued. The title “Heretics” put me in mind of Hillaire Belloc’s “The Great Heresies” – not a difficult read at all, but oh so succinct and relevant today. His chapter on Islam as a heresy of Christianity is hands down the best thing I have ever read on Islam. It’s a short chapter and well worth it! I hadn’t heard of that title by Belloc, so of course it is now on my list. Sounds fascinating! I loved Eifelheim and have been wanting to read more by that author. Laurus is in my wishlist, waiting for me to have an opportunity to get to it. I would love to know what you think if you read any of his other books, Kelly. I like his style so far! So, it intrigues me that you have a sci-fi title on this list. I can read sci-fi if it meets certain criteria. (I have read all the books in the Enderverse by Orson Scott Card.) The criterion (there’s really only one) is this: the characters must be excellent. Plot is optional. Should I give Eifelheim a try? We are currently finishing up our last academic week, then I have one more book selling gig (conference) to go before I can refill my tank, hopefully beginning in June. this is our last week of full school- we will be some over summer because baby is coming but it’s lighter & follows mornings at the pool. ?????? I’ve got multiple books going in each of these categories – hopefully I’ll finish some up over the summer! Evaluating Books may be one I try to pre-read for Year 10. I must admit to not being enthusiastic about the sub-title (as in I’m not too concerned about what Thomas Jefferson would think 😉 ), but the description looked interesting. A suggestion for some fairly light non-fiction, but still profound – and funny: Tremendous Trifles by G. K. Chesterton. It’s on my bedside table as the chapters are short and self-contained, and easy to fit in before bed if I’m not too tired. A few are listed for AO Year 10, but I may end up assigning the whole book to my daughter. Ha. Y10 is why I’ve got the book sitting on my desk, Anna! 🙂 I think the reason why he brings up Thomas Jefferson (subtitle doesn’t thrill me, either) is that he’s actually talking about identifying bias? That is my best uninformed opinion, since I’m reading it soon, but not yet. I was just given the book Laurus for a gift recently but haven’t read it yet. Alice’s Adventures in Wonderland tops the list of one of my favorite read-alouds we’ve done. Some books don’t work so well as read-alouds, but this one definitely does! I’ve also read The 39 Steps, the first of the Richard Hannay series. Have you seen the movie production of it that stars Rupert Penry-Jones? It’s good, but of course a bit different from the book. I had no idea there was a movie version of 39 Steps! I’ll have to look it up. Thank you!